MAY 5, 2018 (YORK, PA) - It was a wild sixty hours for Dave Capobianco. The Thursday before the second Mid Atlantic Wiffle tournament of the 2018 season, the New School Risers’ captain informed MAW officials that he would have to withdraw his team from the event. The erstwhile Old School Riser suffered a grade-2 calf strain a day earlier. As his team’s only pitcher, he believed the injury was severe enough that it would prevent them from competing. It was agreed upon by both parties that the New School Risers debut would be delayed until MAW’s June 16th event. It was only after contacting the tournament organizers that Dave alerted his teammates of what was going on. Dave’s fellow Risers – who, we should mention, also moonlight as his teenage daughter and son – reacted with enough disappointment that it caused him to reconsider. The elder Capobianco – once a star southpaw on Fast Plastic Maryland region stalwarts, the Old School Risers – iced his calf muscles and decided to give the tournament his best shot. Some sixty hours later, the Risers had four big wins, a walk off homerun, several nail-biting victories, multiple clutch hits, and a second-place finish under their belts. Good thing he listened to the kids. The Risers’ run to the championship game was the talk of the tournament. The Salisbury, Maryland team began their day in impressive fashion by mercy ruling the Barrel Bruisers in 1 ½ innings. The Risers were patient and took the free passes offered up by the Bruisers’ Colin Dimitris. Dave made quick work of the Bruisers’ usually solid offense, striking out all six batters he faced. The Risers failed to score a run off ERL’s Connor Young in their second game of the tournament and dropped the contest by a score of 1-0. The trio bounced back in their third game, taking it to the Yaks by a final score of 10-2. The Risers ended their pool play schedule with a 2-0 loss to the defending champions, the Stompers. A couple of wins and a .500 record would have made for a solid day, but the Capobiancos were just getting started. 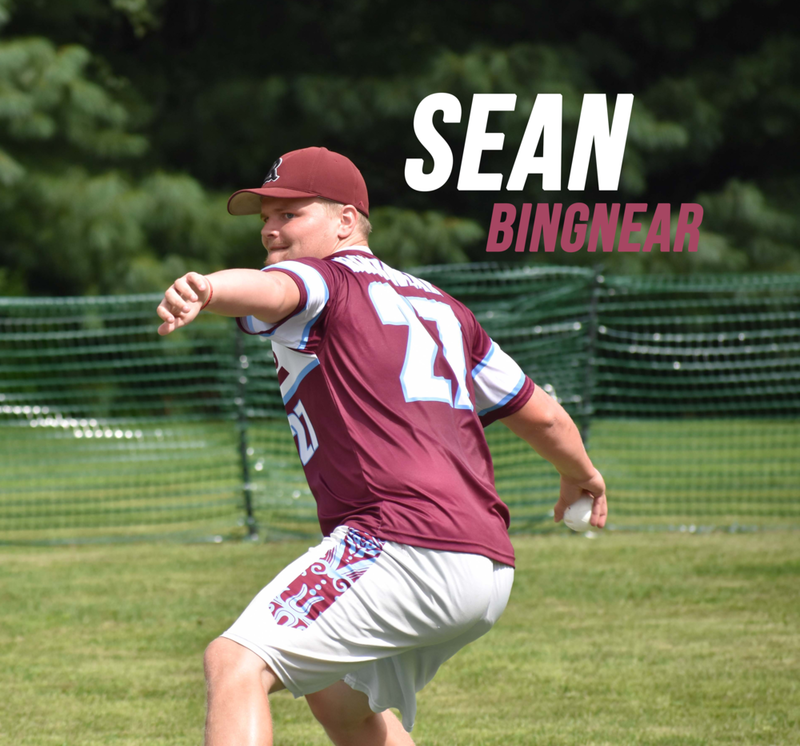 The two victories earned them a play-in game against a fellow debuting 2-2 team, the Ridley Park Longballs, with the final spot in the single elimination round at stake. The play-in game made it through the two innings of regulation without a score. Dave picked up a single and a walk, while his son Matt also added a single, and the Risers took a comfortable total bases lead into extra innings. In the third, the Longballs’ Joey VanHouten narrowed the total base margin to 3-1 with a one-out single. Unfortunately for the Longballs, that was as close as they would get. In the bottom of the third, Dave led off with a walk and two batters later sent his team into the semi-finals on a walk off two-run blast. The walk off ended what was an impressive showing for the Longballs. The group was as deep on the mound as any team in the field. They threw four different pitchers and all four showed talent and upward projection. The Longballs finished the tournament with a very solid +8 run differential. The team represented the Ridley Park Wiffleball League well and the talent in that league is undeniable. Look for these guys to continue to make some noise in MAW – and elsewhere – later this summer. Dave Capobianco (Risers) gets ready to deliver a pitch. The Risers walk-off win set them up for a date with a 4-0 My Name is ERL squad. ERL pitchers suffocated opposing offenses throughout round robin play. Young shutout both the InHumans and Risers, while Dan Whitener – making his ERL debut – shutout both the Stompers and Bruisers. ERL’s bats, however, continued to lag well behind their arms. After putting up seven runs on the InHumans, ERL managed only two runs in their next three games – a pair of 1-0 victories and a 0-0 total bases win against the Bruisers. It was still an improvement over the first tournament, where ERL scored only one run in three games and created far fewer scoring opportunities. Having already scored off Dave Capobianco once and with Blake Hoffman completely fresh, ERL were the heavy favorites against the Risers in their semi-final meeting. The game that followed was the best of the tournament and among the most exciting games played in MAW’s 15 months of existence. The game entered the third inning scoreless. After retiring the first batter of the inning, Hoffman walked Matt Capobianco but came right back to punch out his dad. A first pitch strike to Kyleigh Capobianco had Hoffman just one pitch away from getting out of the inning and keeping the game notched at zero. Instead, the talented southpaw left a screwball over the plate and Kyleigh got all of it. The ball nearly cleared the right field fence on Horn – an impressive feat given that field’s dimensions and slight upward slope – but instead bounced off the wall for a run scoring triple. The big blow seemed to take all the wind out of ERL’s sails. Hoffman regrouped to keep the margin at one, but ERL’s offense failed to convert on a first and second opportunity in the third and then went quietly in the fourth. Three outs away from a loss, Soup took matters into his own hands. ERL’s captain led off the 5th inning with a triple to put the tying run ninety feet away. Whitener followed up with a walk but Capobianco got Schlindwein and Hoffman to strike out. Not deterred, Soup shot a single back up the middle to tie the game and give ERL new life. A rejuvenated Hoffman struck out the side in the 6th. In the 7th inning, however, Dave got a hold of another pitch and pulled it over the right field fence for a tiebreaking homerun. This time around, Dave made the run hold up. He shut down ERL in the bottom half the inning to pitch his team into the finals. As for ERL, Soup chose not to dwell on the loss and instead offered some perspective on his young left-hander. The final was a matchup of the tournament’s two iron men as Capobianco squared off with the Stompers’ Chris Sarnowski. Entering the finals, Capobianco had 23 innings logged on his arm already while Sarno came in with 20 innings pitched. Despite the heavy workload, neither pitcher showed any signs of giving in early. It was not until the 4th inning when Sarno broke through with a solo homerun – his third of the tournament. The homerun seemed to ignite the Stompers’ offense as they followed with four straight baserunners (walk, single, double, single) to plate an additional three runs. The cushion was enough for Sarno and the Stompers held on for their second straight tournament win. Cooke had plenty of praise for both of the championship game pitchers. The tournament win is the Stompers’ fourth in a row dating back to last September and including the October Championship Tournament. The group holds a 19-1 record during that period. Despite that, it was the Capobianco family that rightfully won the attention and affection of the rest of the tournament field. The trio battled all day, got major contributions from all three team members, and never wavered in their determination. For Dave – whose experienced Wiffle Ball success in the past – making this run with his family was extra special. All in the family - the New School Risers battled through a very competitive tournament field to finish in 2nd place. (L:R Kyleigh, Dave, and Matt Capobianco). While Dave was the driving force behind his team – and in almost any other tournament, the clear-cut tournament MVP – his two teammates contributed big hits throughout and only improved as the day went along. Chris Owen (Bruisers) cracks a smile before going into his wind up as his teammates look on. Did you notice anything different about Chris Owen on the rubber last Saturday? The tall righty ditched scuffed balls in favor of a clean one after figuring out a 12-6 overhand drop with it. The results – two runs over eight innings of work against the Yaks and ERL – were self-evident . . . As speculated upon in our tournament preview, Jarod Bull was indeed unavailable to pitch on Saturday, confirming why he played with the InHumans rather than the Yaks. Bull – who thinks the shoulder soreness may have come from throwing a football – believes the injury to be minor and is hopeful it won’t keep him off the flat hill for very long . . . The question was raised on Saturday as to whether the New School Riser’s 1 ½ inning mercy rule victory over the Barrel Bruisers was the shortest game in MAW history. Our crack team of statisticians went right to work on the answer and can confirm that the game did indeed set the record. Interestingly, the Bruisers were on the good side of the old record (two full innings) with 2017 drubbings of Squad 51 and the Stompers . . . The third-place game between the Yaks and ERL was only the second third place game in MAW history. Way Too Beautiful defeated the Barrel Bruisers last July in the first consolation game . . . On Sunday, several tournament participants made their way Baluvelt, NY for the second week of the Palisades WBL season. Connor Young made his debut with the Brewers, picking up two wins while tossing six scoreless innings. Young’s ERL teammate, Dan Whitener, went 1-1, but did not allow a run over 11 innings while playing for the Yankees. April tournaments participants Jordan Robles (1 run, 5 IP) and TJ Hannon (7 runs, 5 IP) also pitched on Sunday in New York. The Longballs look on as ERL and the InHumans do battle on Sheff in an early round robin game. With two tournaments under our belt, it is time to take a first glance at the overall standings. The Stompers put a little distance between themselves and the rest of the field but with four tournaments remaining, the top spot is still up for grabs. ERL sits solidly in the second spot thanks to consecutive 5th and 3rd place finishes. Things get really muddied in the middle with five teams sitting between 12 and 14 points. The runners up at the first two tournaments – Naturals and New School Risers – could be sitting pretty if they can repeat or better their prior finish at an upcoming tournament. The Yaks have yet to fire on all cylinders, yet still are right in the thick of things thanks in large part to their fourth place finish at Torneo de Wiffs. A top two finish in an upcoming tournament would put them in prime shape for a solid playoff seed. With 15 teams competing over the first two tournaments, the Championship Tournament purse is on pace to top $1,800 dollars. * There is still more than enough time for returning teams and new teams to grab a spot in the six-team Championship Tournament with four tournaments – including the Canonsburg auto qualifier – yet to come! * The cited Championship Tournament purse is based on 45 teams over six tournaments. The actual amount could be more or less depending on the number of teams that participate in the regular season tournaments. Dan Potter (Yaks) makes the throw home after fielding a grounder in a pivotal game against the Ridley Park Longballs. Can you think of a better way to spend Father’s Day weekend than playing Wiffle Ball? We can’t! Join us on Saturday, June 16th in York, PA for Wiffle Wars – the third tournament of the 2018 MAW regular season! A handful of teams are already committed for the event and interest in this one is high. This could very well end up being one of the most competitive tournaments of the summer anywhere, so don’t wait to sign up! Contact timcooke1982@gmail.com or visit www.midatlanticwiffle.com for more information! After June, MAW returns to York twice more in 2018 on July 14th and August 4th. It is not too early to register for either of those events, both of which promise to be ultra-competitive as the season heads down the home stretch. Last but certainly not least, MAW caps off the regular season with our debut in Canonsburg, PA on August 18th. Located just outside of Pittsburgh and home to our friends and co-tournament sponsors, the Wiff is Life League, Canonsburg is an ideal location for teams in Ohio, Western Pennsylvania, and West Virginia looking to compete. Not to mention, the winner of the tournament receives an automatic bid to the MAW Championship Tournament on Saturday, September 8. This is a tremendous opportunity for teams from anywhere in the country to test themselves against top notch competition, win some cash, and earn a chance at winning even more come the Championship Tournament. And as always, check out our friends at www.wiffleballtournaments.com for the latest information on tournaments and leagues all around the country. Whether is with MAW or elsewhere, get out there and play ball!